Lopes works with one simple motto in mind: "Above all else, make them laugh". 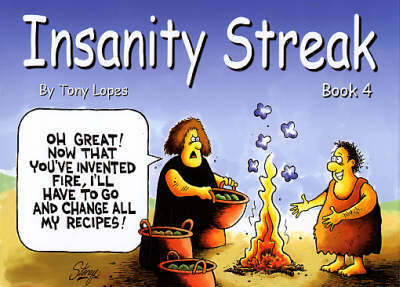 And that is certainly the case with his hugely popular comic strip "Insanity Streak", which he created in 1995. Through this single-panel, floating theme cartoon, Lopes applies his keen wit to the small moments of everyday life, finding humour in the quirks of human nature. Since 1995, Lopes has amassed an impressive list of awards and his work has been growing in popularity across the world. He has won Best Comic Strip for the 5th time in the last 7 years and once Best Single gag artist with "Insanity Streak" at the Australian Cartoonists Association Stanley Awards, voted by industry peers. "Insanity Streak" is the only cartoon to win Stanley awards in both the comic strip and single gag categories. "Insanity Streak" has also twice been judged Best Comic Strip at the Rotary International Cartoon Awards, which are presented in Coffs Harbour, Australia. Currently, "Insanity Streak" is published in more than 50 Australian newspapers, including leading publications such as "The Daily Telegraph", "Sunday Telegraph", "Canberra Times" and "Sunday Mail", as well as a couple of weeklies..." The Busselton-dunsborough Mail in Busselton" and "The Mid-West Mail in Geraldton". Internationally, his work appears in the "UK's Daily Mail" and is syndicated in Hong Kong (daily in the "South China Morning Post"), Malaysia ("The Malaysian Star"), South Africa, Cyprus and New Zealand ("Waikato Times", and "Daily Times in New Plymouth"). Sweden is currently promoting the cartoon and interest has been received from Norway.